How to make bread in five minutes a day? Hot Cross Buns for Easter! Hot cross buns, hot cross buns, everybody loves hot cross buns! are the words to the children’s song, and they hold true even now. These little buns are traditionally served at Easter time: A sweet dough that is spiced, studded with dried (sometimes candied) fruit and decorated with a cross made of icing. I made them after many requests and my kids devoured them within minutes; they were nervous about the raisins, but the cream cheese crosses and scent of cinnamon and nutmeg drew them in. As I researched these delicious buns I realized that there are just as many ways to make them as there are families who bake them. Some people slash the dough to make the cross, others use a flour and water paste to create the symbol and others use the sweet icing. Tell me how you make your buns, and if you don’t have a family tradition yet, you can start with these! If you follow along on our Breadin5 Instagram, you can watch us make the buns in our Instagram stories. The recipe comes from our latest book, Holiday and Celebration Bread in Five Minutes a Day, which also has a whole chapter on Easter bread recipes. This fanciful holiday bread made it into our newest book, Holiday and Celebration Bread in Five Minutes a Day , and it is one of the prettiest, easiest and most sensational breads to make for a family gathering or work party. This Holiday Star Bread has been making the rounds all over social media, so I decided to try it with some of our no-knead Challah dough. I’m happy to report that it works quite well, and it is not that difficult to make. Most of the recipes online have the same directions for shaping the star, so I borrowed from those when practicing, but substituted pumpkin pie spice for the cinnamon just to change things up a bit. We also have a variation with jam, but Nutella or many other fillings would be fun, so if you are interested in playing around with recipe, there is room for your own interpretation. If you do end up making this bread and post on social media, tag #breadin5 so we can see your creations! You can also find us on Instagram at @breadin5. Tiny baked buns filled with ham, cheese, mustard, mayo, honey and covered in poppyseeds – what’s not to love? I came across the idea for these ham and cheese brioche sandwiches while paging through cookbooks, and immediately headed to the kitchen to make them. With all the ham, cheese, mayo, and butter, I wanted to keep the brioche buns on the lighter side, so I used our no-knead challah dough–it’s basically a light brioche. Plus, my family swoons every time I make it. I wasn’t wrong. These buns are delicious, and they are perfect for every occasion. Breakfast, lunch, dinner, snacks, baby showers, pool parties, even Father’s Day. When my boys were little I took them berry picking. The concept was a good one and in my head it would be like a scene from Kinfolk. The boys sitting quietly by the raspberry bushes, adorably tossing berries into a gingham lined basket. The reality was more Lord of the Flies meets Blueberries for Sal (which is my all-time favorite children’s book). The boys would never sit still in a setting as inviting as this for running and wielding sticks, in-which to sword fight. Nor were they likely to toss a single berry into the basket, when they could just as easily eat them. So, I picked berries, while keeping an eye out to make sure my children were not impaling each other and were accounted for. I got enough berries to bake with, but they were not-so-ceremoniously consumed in the back seat of the car, by the aforementioned sword fighters, on the way home. It was an absolutely charmed day in its way, but not if your goal was to bake something tasty. We stopped at the store and bought perfect raspberries, I baked a lovely raspberry brioche braid, that ended up in ABin5 and I have not gone berry picking (with the intention of bringing home berries) since … true story! This raspberry brioche braid is ideal for breakfast, brunch, after school snack or makes a sweet gift for your neighbor who just had an adorable baby (as mine recently did). When you have a bucket of brioche in the refrigerator this brioche braid can be put together in a no time. First, I used the berries to make a quick jam, which is so simple and delicious and I recommend making extra to just have around. The red of these berries makes for a ruby colored jam and the flavor is just pure raspberry, no additives or binders. The jam is spread over a layer of rich cream cheese filling and then the dough is folded over the fillings in a pattern that looks fancy, but is incredibly easy to do. The finishing touches are a fresh raspberry glaze and sweet whole berries. It will impress everyone and they’ll assume you spent so much time preparing it. They never need to know how easy it is, until you share this recipe with them. My mom informed me today that I was in charge of planning Mother’s Day this coming Sunday. Now that I have two children of my own, I thought that this duty could be passed along to someone else, perhaps someone planning my Mother’s Day. Apparently it doesn’t work like that. She vaguely mentioned something about being Queen Mother and I’ll just have to wait my turn, so Mother’s Day breakfast is on. Good thing I like her a lot, and also like baking bread. 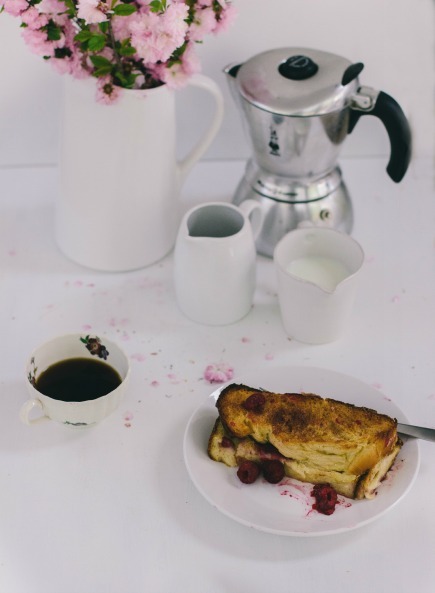 I’ve found brunch to be ideal for that Sunday morning celebration, but eating out is usually a busy affair in these parts. Baked French toast is now my answer to the “what are we going to serve?” question. 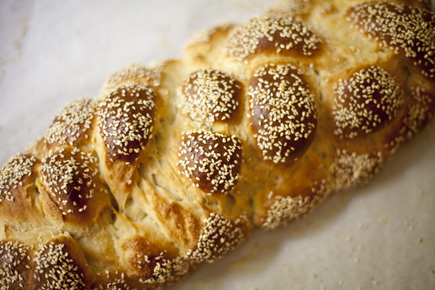 It is put together in the evening, where the milk and eggs soak into the layers of challah overnight. The next morning it is baked, served warm, and gone within minutes. It also makes me look like I worked much harder than I did. Tomorrow I will celebrate Rosh Hashanah, the Jewish New Year, with family and friends. 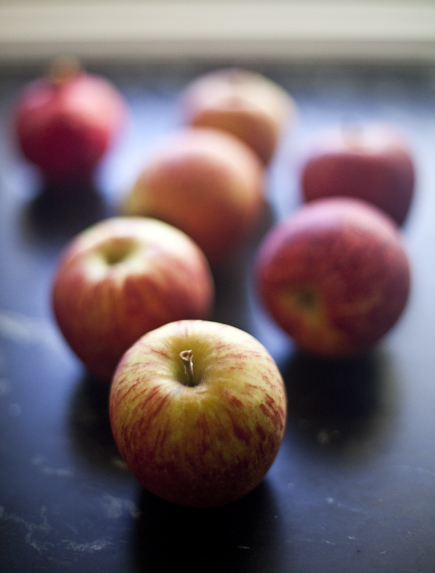 It is traditional to eat lots of honey and apples during this high holy day to usher in the new year with sweetness. 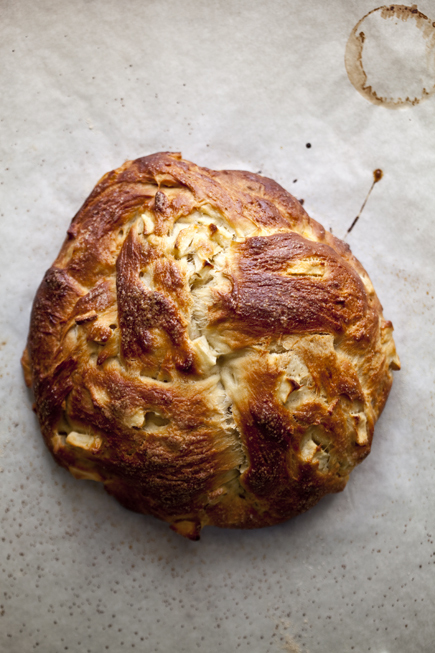 The challah dough from The New Artisan Bread in Five Minutes a Day is made with honey, then I fold chopped apples into the dough and braid it into a circle. You can do any shape you like, but the circle is meant to symbolize the full cycle of the coming year. This bread may be ubiquitous at the high holy days, but it is wonderful anytime, especially during apple picking season here in the Midwest. 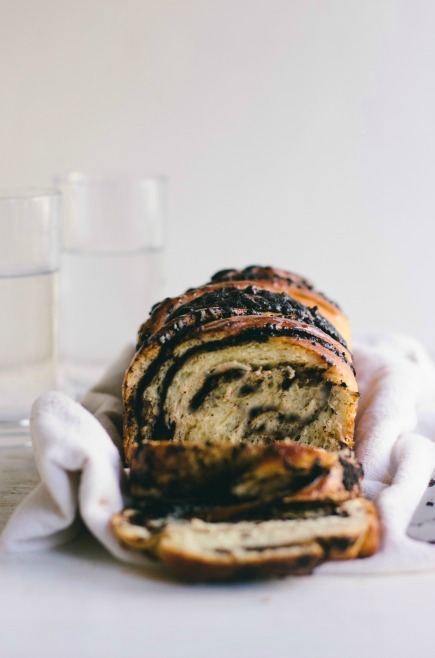 Braided Chocolate and Cocoa Nib Bread… and announcing a winner of the giveaway! I’ve been slightly enamored with braided bread this Holiday season – it’s been popping up all over our Pinterest boards, in loaf, wreath, cake, and roll form. I was especially interested in a krantz cake Tara from Seven Spoons made recently; her loaf was braided and twisted so beautifully, and I was sure there was a way to turn it into a Bread in 5 version. Some brioche dough and chocolate-cacao nib filling later, and I had a winner. This bread is a looker, the chocolate leaving swirls throughout and the sugar glaze giving the finished bread a sparkly sheen. It’s sweet but not overly so, and the cacao nibs give just the right amount of crunch. It’s a great edition to your Holiday baking line up. And, as promised, we have a giveaway winner….congratulations Janna, we’re sending you the Emile Henry Bread Cloche, Gold Medal Flour, Platinum Yeast from Red Star and a Signed Copy of The New Artisan Bread in Five Minutes a Day. Enjoy! September is the month of the Jewish high holy days of Rosh Hashanah and Yom Kippur. This Six-Strand Braided Challah, using our five minute dough, is a beautiful and festive way to celebrate. 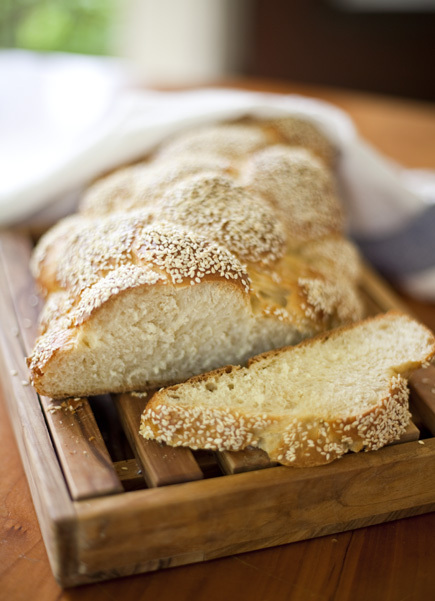 Traditionally for Rosh Hashanah we bake the bread in the shape of a ring studded with raisins, but if you serve any of our delicious challahs you will do the holidays justice. Braiding six strands takes a bit of technique, but once you have the rhythm the braid goes together quickly and easily. Keep in mind that you are only working with one strand at a time, so there is no juggling to do. You want to be sure to keep your hands and work surface well floured so the strands don’t become sticky as you work. Left the dough on the counter overnight! Can I still use it?